100% green - Digigreen ticks all the boxes for an environmentally friendly paper guaranteed for laser and digital printing. The importance of using a reliable and recycled paper has increased dramatically. This paper/card will provide exceptional printing quality while meeting even the most stringent environmental standards. DigiGreen is available in a full range of grammages from 100 gsm to 350 gsm in both gloss and silk, please see other items in this category. 100% green – made from a minimum of 50% recycled fibres, DigiGreen has a FSC (Forest Stewardship Council) mix credit certification and European Ecolabel accreditation. Printing Quality :- Offers a uniform ultra-smooth surface and a superior toner adhesion, which provide the highest printing quality. Its excellent printability and runnability ensure trouble free printing. Whiteness:- Outstanding whiteness that is comparable to virgin fibre papers, it's high bulk and good opacity, make DigiGreen the ideal alternative to standard laser and digital papers. 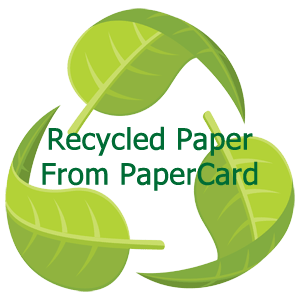 PaperCard along with its suppliers take our environmental responsibilities very seriously, and by using DigiGreen Gloss or Silk you are generating ecological savings compared to a paper made from 100% virgin fibre. Please note :- this item is not available on Express or Timed Delivery Service.